Friday morning's monthly jobs report from the government's Bureau of Labor Statistics showed a level of February job additions which the establishment press quickly portrayed as tremendous news. The Associated Press described the results as "a welcome surprise," achieved "despite a blast of harsh winter weather." Bloomberg News claimed that "the U.S. economy is starting to shake off the effects of the severe winter weather." Reuters heralded it as an "upbeat sign for weather-beaten economy." Opportunistic Obama administration Labor Secretary Thomas Perez crowed: "We're moving in the right direction." Do not be fooled. Especially be wary of "the prevailing view of economists," which is that "when the weather warms up, so, too, will the U.S. economy." 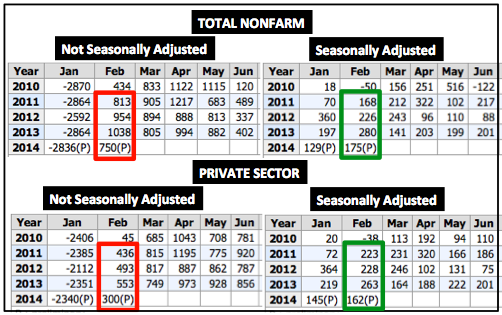 All of the "surprise" in Friday's employment report lies in how BLS could possibly have converted truly awful raw data into decent-looking numbers — 175,000 payroll jobs added overall, with 162,000 of them in the private sector — after performing its seasonal adjustment calculations. We had better hope that the raw numbers came in as weak as they did due to February's rough weather. If they didn't, we may be facing the worst year in the job market since 2010. For those unfamiliar with the process, "seasonal adjustment" is "a statistical method for removing the seasonal component of a time series that is used when analyzing non-seasonal trends." In layman's terms, it's an attempt to smooth out results which fluctuate throughout the year to present them in proper context. For reasons which I have never understood, economists, analysts, and especially reporters seldom go beyond the seasonal adjustment calculations to look at the raw, not seasonally adjusted data, aka the report presenter's best estimate of what actually happened. This has always been a negligent practice; but it's especially dangerous now. That's because, as I wrote last year, "five years of the Obama economy render the government's seasonally adjusted numbers virtually worthless." As we near six years since the Pelosi-Obama-Reid economy began, its erratic nature continues to disrupt normal seasonal patterns. February's figure of 750,000 jobs added overall was the worst February since 2010, the final month of the Obama economy's extended "jobs recession." (The administration likes to crow about its 48 months of consecutive though sometimes tepid job growth, but always overlooks how it managed to unprecedentedly extend job losses a full eight months after the recession officially ended in June 2009.) "Somehow," that result, which is 288,000 jobs below last year's 1.038 million, converted to 175,000 seasonally adjusted jobs added, only 105,000 fewer than last year's 280,000. In the context of both February 2013 and February 2012 — BLS seasonally adjusts using five years of data, but weighs recent years more heavily — the reported result should have been barely above zero, in which case we'd be seeing the press citing the weather as the go-to excuse instead of something the "resilient" job market heroically overcame. The private sector's reported 300,000 job additions in February is 46 percent lower than last February's 553,000, and is thus even more troubling. In historical context, its seasonally adjusted result should also have come in barely positive. Unfortunately, those who suspect that BLS may have fudged its presentation now have some basis for holding that belief. Since January 2013, fever swamp leftist Erica Groshen has occupied an influential perch as its commissioner of Labor Statistics. As an opponent of her nomination said in 2012, "To place at the head of the bureau someone with a far-left record ... has the potential to diminish the believability of the information that they produce." The narratives in BLS's monthly employment reports during the past year have clearly come across as more selective, inconsistent, and politicized than in the past. One would hope that Groshen's influence only extends that far, but it would be foolish to dismiss the possibility that it doesn't go further. The job market's clearly bad February could not have come at a worse time, as I'll explain on the next page.